Delivered Long Beach 11/9/43; Scott 29/9/43; Assigned 333BS/94BG Rougham 8/10/43; Missing in Action Brunswick 11/1/44 with Don Sharps, Co-pilot: Tom Sheedy, Navigator: Fred Irwin, Flight engineer/top turret gunner: Ed Deutsch, Radio Operator: Gus Lobone, Ball turret gunner: John Fees, Waist gunner: Bill Nall,Tail gunner: Joe Miksic (8 Prisoner of War); Bombardier: Lou Nargi, Waist gunner: Ken Majeska (2 Killed in Action); enemy aircraft, crash landed near Holsten, three miles N of Rheine, Ger; Missing Air Crew Report 1887. About ten minutes after bombs away over Brunswick, Lt Sharps‘ B-17 received a direct hit in the no.3 engine from German fighters. The engine immediately fell out. This loss of power made it difficult for Lt Sharps to keep up with the formation and slowly but surely they became in the unfortunate position of being a straggler. Approaching the Dutch/German border, things became really hairy. With no.1 and no.2 engines overheated, the crippled plane got riddled with bullets from attacking FW-190’s. During these attacks the bombardier Lt Nargi and the Left Waist Gunner Sgt Majaska were fatally hit. Also the unfortunate Navigator, Lt Frederic Irwing, who already was wounded earlier by shrapnel, was hit by several bullets all over his body and was bleeding heavily. Lt Sharps considered the situation as being hopeless and ordered all his capable crewmen to bail out. After having given the bail out order, Sharp regained some control over the plane and decided to try to crashland the plane instead of bailing out too. 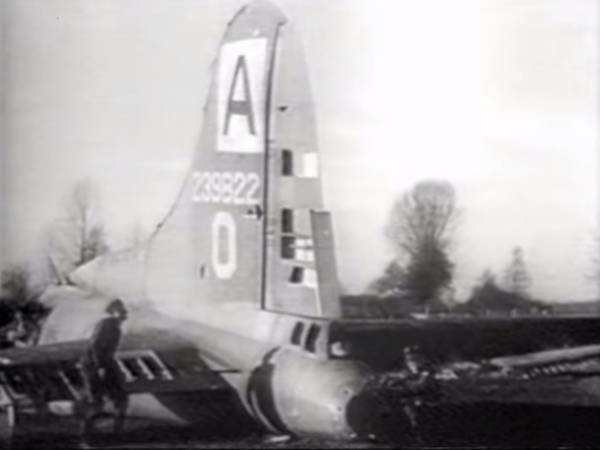 He found a suitable place and put the plane on the ground near Osterwick, west of Münster, at 13:27 hours. Directly after after landing, Sharps immediately evaded the aircraft. Also the badly wounded Navigator Frederic Irwin managed to leave the plane.